Sequential Spelling (SS) - I have been shopping around for a spelling curriculum that works for both of my soon-to-be 3rd graders. 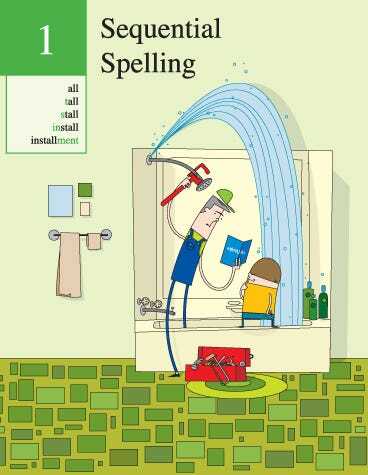 I wanted to love All About Spelling after hearing so many good reviews, but it just wasn't for us. Sequential Spelling is a super efficient program that has helped both of my kids with spelling, handwriting and decoding larger words all without taking a ton of time. We are on Day 31 and so far, it's a keeper! JJ needs to work on spelling as well as reading larger words. This looks like it will help him practice seeing where he needs to break words into parts. It's also good handwriting practice for him. Sequential Spelling is also a good fit for my terrified-of-making-mistakes girl. She definitely had a period of adjustment where she would melt down because of a mistake. The part of the program that I love is that the kids get to correct their own spelling immediately which takes a ton of pressure off. She's finally able to relax and focus not just on spelling, but on making her handwriting pretty. I bought the Original AVKO versions through Rainbow Resource. The only thing you need is the book. The student response books are optional. I just Pro-Clicked some writing paper for them. If you see the Revised Version, the Teacher's Book has the same lists along with activities such as word searches, making them more like a workbook. I'm perfectly happy just using the lists. For more reviews, check out Pioneer Woman's homeschool blog and this one from Modern Homeschool. Here's the full 8 lesson sample where they start with spelling in and be and by day 5 they are spelling beginning. This worked great for Hermione who is more of a natural speller. JJ is not and was becoming frustrated when his sister would finish before him. I soon realized he needed something that would hold his hand a little more, so I started him on Apples and Pears Spelling. This has been going well and it looks like this is the one for him. Hermione is continuing with SS and we recently discovered she likes spelling out loud with a white board handy for the really long words. Many times she'll get stuck on a word only to write it out correctly. This seems to be working for her and gets us through spelling a little quicker.